Cigar Alley in Merchantville is a slice of cigar smoker heaven. The shop gets its name from the fact that the entrance to the walk in humidor is in the side alley of The News Nook. Now, generally, any avid cigar smoker will tell you that it’s best to avoid buying cigars from any news shop, or liquor store, humidors. Besides the fact that those places don’t take the proper steps to maintain care of the cigars, they usually carry a poor selection of good cigars. 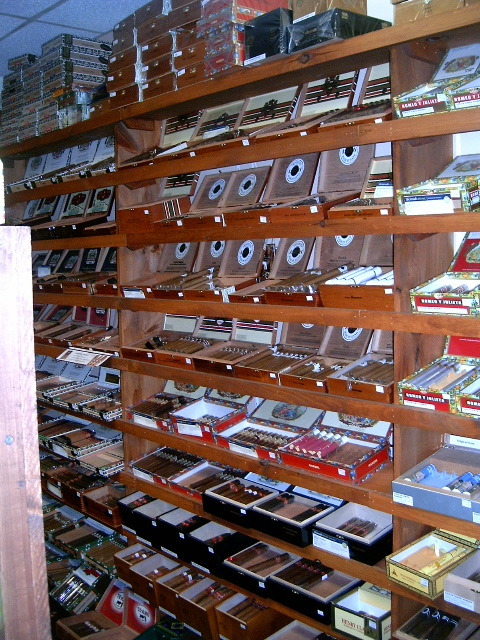 But there’s always an exception to the rule, and Cigar Alley is that exception. 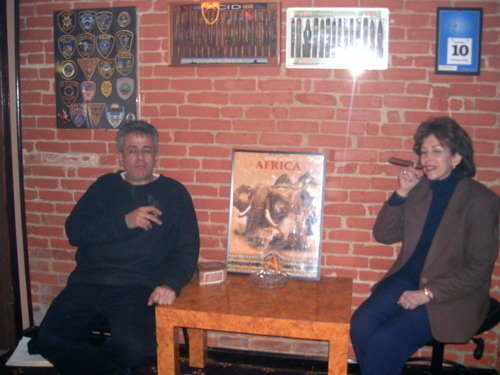 Sam and Shelley are the proprietors of Cigar Alley and, unlike most business owners, are almost always on premises. This is a nice touch when the owners of the shop are there to answer your cigar questions, no matter how mundane they may be. It’s this business style that has kept them as successful as they have been in the past years. With the advent of “big league” tobacco shops, like the Holt’s Cigars in Philadelphia, the smaller shops have been getting pushed out of business. But Cigar Alley is different than most of the other small shops. Their humidor is stocked with a very good selection of cigars and they also advertise the fact that they carry the most affordable cigar bundles in town. For any smoker that owns a humidor, buying a good cigar bundle is a nice way to start stockpiling a stash of cigars you can go to if you have a random urge to smoke, or want to offer one to a guest. I, myself, plagued all the staff with questions when I first went there. But from those questions, I found a style of cigar I liked. With the different wrappers available, and the different fillers a cigar can be rolled with, smokes vary from mild to robust, and flavors vary from spicy to smooth. Long time cigar smoker and Cherry Hill resident Scott Williamson, 48, is at a much different point in his cigar smoking life. With a newly redone lounge, Cigar Alley has that homely feel for all customers. If you go on a Friday night, you can be a part of the weekly wine and cheese night. The staff invites all their customers to enjoy themselves, indulge in the wine and cheese, and smoke cigars in the lounge if they choose too. It’s a relaxed, and friendly, environment. And every so often there’s a special event night to stumble upon. Their biggest turnouts are the hand rolling nights. Cigar Alley brings out a a cigar roller, and they set up their table in the alley, and roll fresh cigars to order. Just recently, Cigar Alley did an Ashton night. Basically, any cigars made by the Arturo Fuente company, who makes Ashton cigars, were buy three get one free or buy one box and get one box free. A representative from Ashton was also there explaining the different cigars to the potential buyers. The free cigars were quality ones as well. I purchased three La Aroma de Cuba cigars and received a San Cristobal XXL in return. Cigar smokers can buy their sticks anywhere but it’s always nice when you find a shop that takes cigars seriously. Cigar Alley, for its size, is one of the best local smoke shops around. If you’re serious about getting into cigars, or are considering trying something new, the staff at Cigar Alley is more than capable at finding something to suit your palate.